35%OFFSALE *** MissManeater ROCKNROLL_RING double tie thin halter top RING sliding soft band brazilian pant! ***MICRO coverage! 35%OFFSALE *** MissManeater ROCKNROLL_RING double tie thin halter top + RING sliding soft band brazilian pant! ***MICRO coverage! This double tie thin sliding halter top with SILVER ring detail and spaghetti ties is perfect for that girl who wants a little more cleavage than coverage. Made from the highest quality BLACK wetlook spandex fabric, you will NOT find this #maneaterSTYLE anywhere else! It is finished with BLACK lining on the cup for a HIGH quality finish. We have matched with our RING side soft band sliding brazilian boutique bikini pant. Try something different today! Stand out from the crowd! Show the WORLD you are a REAL 'maneater'! 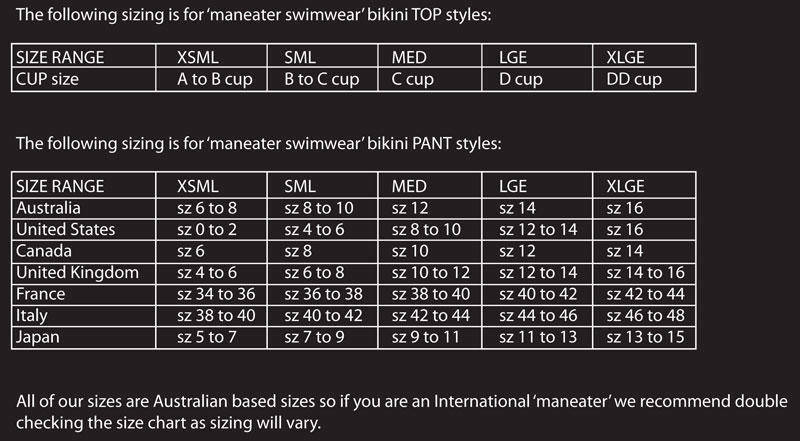 All MissManeater designer swimsuits + boutique bikinis are HAND-MADE with LOVE in Australia!